We just came back from a family vacation in Reno and Tahoe. We had a wonderful time playing in the snow, and we brought back a few souvenirs, a lot of wonderful memories...... and bad coughs and sore throats for five out of seven family members! I guess the icy cold weather plus the all the cold and flu germs swirling around in the air, there was no way we could avoid it. Fortunately we recently received samples of new Ricola Extra Strength to try out.... and these herbal drops have worked out so well, we are all clamoring for more! Everyone loved the taste of Ricola Extra Strength -- slightly minty, slightly sweet -- and everyone loved how these drops soothe sore throats and help suppress the urge to cough. I'm definitely stocking up on Ricola Extra Strength for the cold and flu season, and you should, too! Don't believe me? 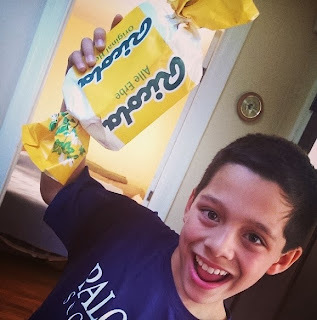 Enter to win some Ricola Extra Strength in my giveaway below! One lucky Bonggamom Finds reader will win a Ricola Soothing Relief Pack consisting of Ricola Extra Strength herb drops and a $30 Visa Gift Card! We would like to send you the new Ricola Extra Strength and a $30 Visa gift card so you can discover Chruterchraft this cold and flu season. If you’d like to participate, please use the hashtag #swissherbs with your blog post and on your social media properties (Facebook, Twitter, Instagram and Pinterest). Leave a comment on this post telling me what was your favorite present that you received this holiday season. This giveaway ends at 11:59PM PST on January 10, 2014; I will draw a winner at random on January 11 and post their name after they confirm acceptance. Continental US residents only. For additional giveaway rules, click here. Disclosure: I received a product sample of Ricola herbal drops and a gift card to facilitate my review, but have not been paid to review the product or give my opinions. Giveaway prize pack and product information (in italics) is provided by Ricola. The views and opinions expressed here are my own. Belated Merry Christmas -- and a LeapReader Giveaway for you! (belated) MERRY CHRISTMAS (if you celebrate it) AND HAPPY HOLIDAYS (whatever you do celebrate)!!! Of course, it wouldn't be the holidays without presents, so I'm giving away a LeapFrog LeapReader! There's no better gift to give than the gift of reading, and LeapFrog's latest version of the TAG is better than ever -- not only does it help kids learn to read, it helps them learn to write as well! I was supposed to post this giveaway on Christmas morning, but well, you know how that turned out -- but better late than never! This giveaway ends at 11:59PM PST on January 7, 2014; I will draw a winner at random on January 8 and post their name after they confirm acceptance. Continental US residents only. For additional giveaway rules, click here. It just wouldn't be the holidays without holiday parties! I've already been to quite a few: a holiday party for a visiting friend, a company holiday party, a blog event, and two performances of the Nutcracker! I love dressing up and celebrating with family and friends, so it's important for me to have the right outfit that reflects how special the season is. Who says lace is for fuddy-duddies? This lace dress is so elegant, I can almost imagine Jackie Kennedy Onassis wearing it. The best thing about the little black dress is that it can flatter any shape and size. LightInTheBox has gorgeous dresses for plus-size women -- like this sheath dress -- so you can look good in any size! No one should have to hide their curves in a shapeless tent! Okay, this chiffon dress isn't black, but isn't burgundy the new black? The dress fulfills all the basic requirements of the little black dress: simple, classic, universally flattering. Besides, you can also get it in black if you want. Here's a version of the above dress in black, this time with a sparkly brooch on the waistband. Who needs jewelry when your little black dress comes complete with bling? 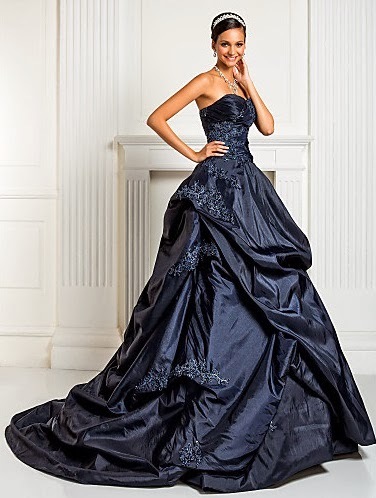 I'll probably never attend an occasion formal enough to justify this beautiful black ballgown (the photo shows the dress in navy blue but it's available in black), but a girl can dream, can't she? Check out LightInTheBox.com's holiday dress collection! Which one is your favorite? Disclosure: I am receiving a LightInTheBox dress as a thank you for writing this post. The views and opinions expressed here are my own. Hershey's sent me an assortment of candies from their Holiday Collection, and it's like our home has transformed into candyland. The kids love it, and I've been so inspired to create all kinds of treats! Since school is about to go on winter break, I wanted to make little baked treats for the kids' classmates. 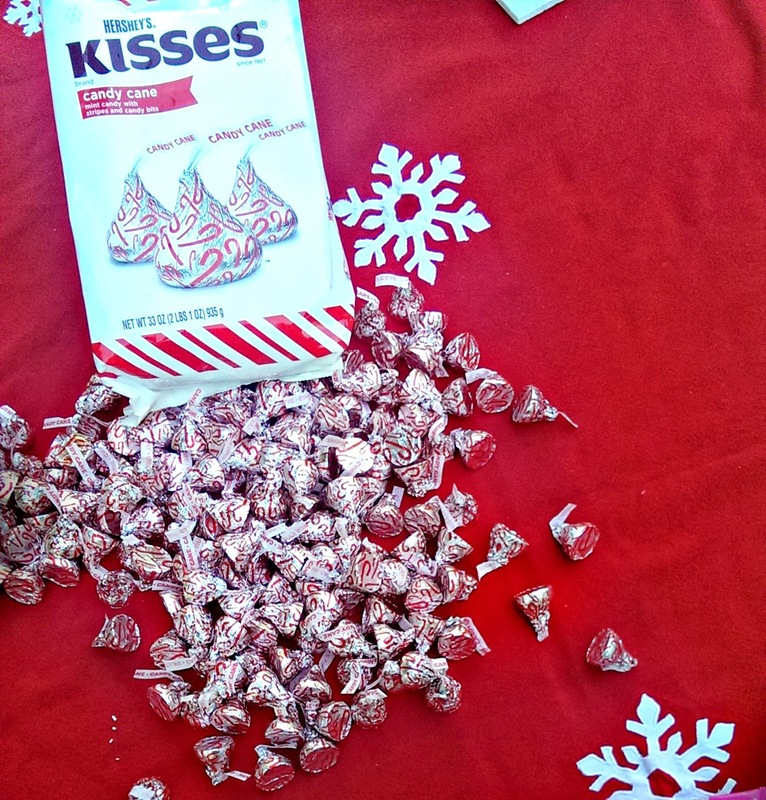 Hershey's sent us a giant (34.6 oz) bag of their Candy Cane Kisses, which are mint candy with tiny red candy pieces and red stripes, shaped like a traditional Hershey's Kiss.. 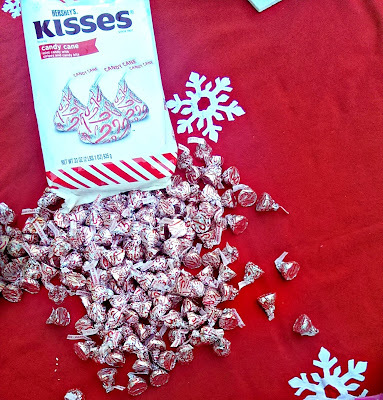 They are wrapped in silver and red foil, which makes them perfect for the holidays! I got the recipe from Our Best Bites. The cookies are delicious even without the Candy Cane Kiss, but adding the Candy Cane Kiss makes them sensational! 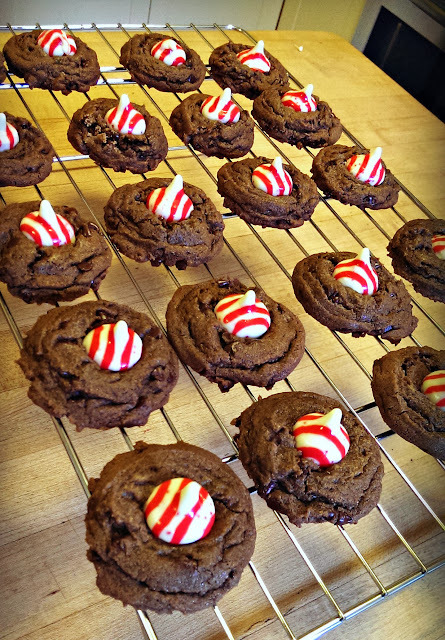 They taste like a luscious mint brownie, and the red and white peppermint stripes make them look so festive. They'd be great for a cookie exchange or any other party, especially because they're sooooo easy to make! 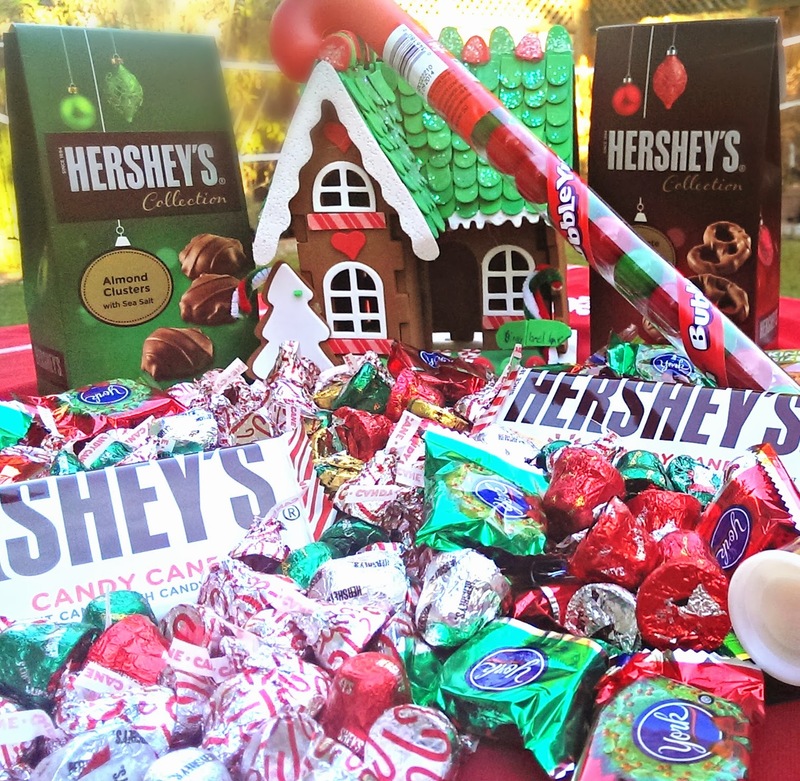 One lucky Bonggamom Finds reader will receive an assortment of candy from the Hershey's Holiday Collection! 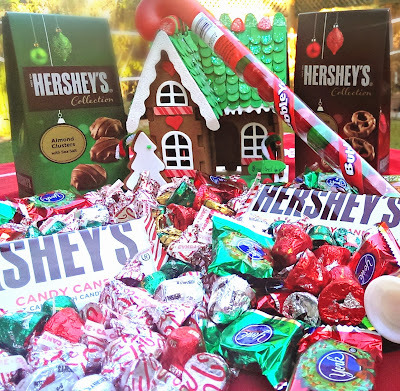 Leave a comment on this post and share your favorite Hershey's Holiday Candy. This giveaway ends at 11:59PM PST on December 24, 2013; I will draw a winner at random on December 25 and post their name after they confirm acceptance. Continental US residents only. For additional giveaway rules, click here. Disclosure:I received a product sample to facilitate my review, but have not been paid to review the product or give my opinions. t. The views and opinions expressed here are my own. The holidays are always better when we spend them with family and friends! There's nothing like gathering to catch up, share and celebrate over good music, yummy food, or a hot cup of coffee. This year we have our favorite houseguests for the holidays: Alfie's mum and dad, who are visiting from England. I like to do everything to make my guests comfortable, and this year we have something extra special: our very own Nescafe Dolce Gusto Genio machine! We received one from Mom Central and Nescafe to review, along with four flavors to try: Chai Tea Latte, Skinny Latte Macchiato, Caramel Latte Macchiato, and Chococino (hot chocolate). 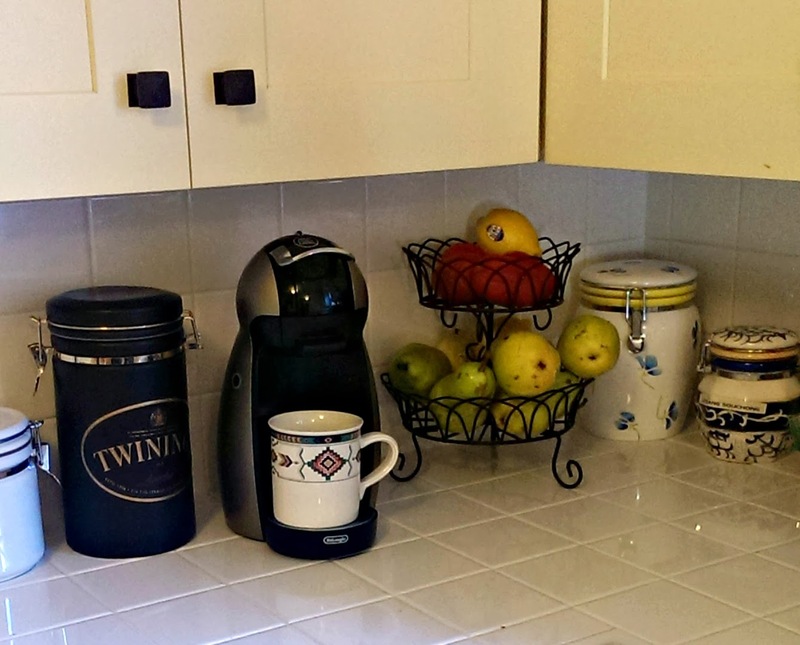 After just a week, we can't imagine our kitchen without the Dolce Gusto! Each of us enjoys our favorite Dolce Gusto drink every day (the kids would drink multiple Chococinos daily so I have to ration them :) I've already bought multiple refills so we never run out! It's so nice to be able to offer Alfie's parents (and other guests) their choice of good coffee, not just instant coffee or brewed coffee that requires time and energy with a coffee press. Cream butter, sugar and eggs. In a separate bowl, dissolve the cocoa powder in the hot brewed coffee. Add to the butter, sugar and egg mix. Mix in flour and salt. Pour mixture into an 8x8 pan lined with parchment paper. Bake for 35 minutes at 350 degrees Fahrenheit. 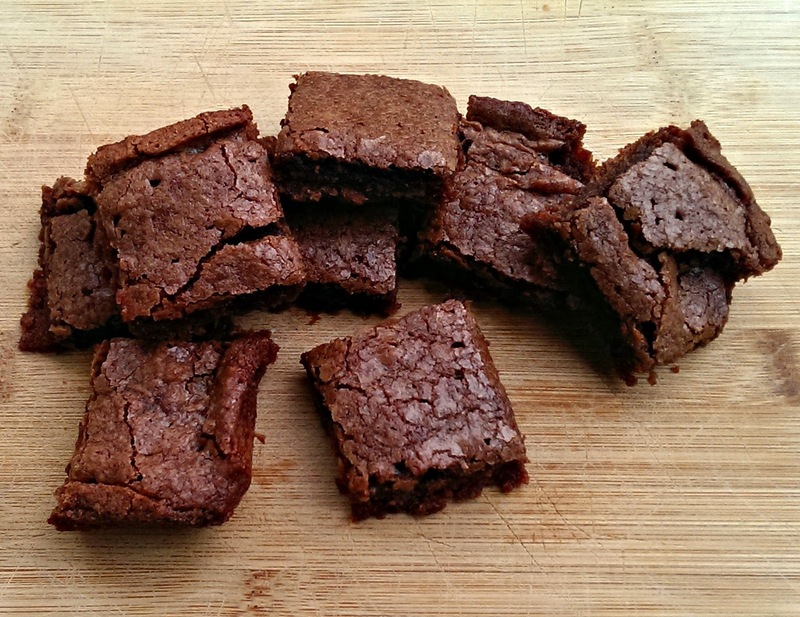 Let the brownies cool in the pan for 5 minutes before lifting from the pan. Slice into 9 squares. These brownies are amazing -- you can really taste the coffee, and it pairs perfectly with the chocolate. Just think of all the yummy holiday treats you can make! We made peppermint hot chocolate the other night by using a peppermint candy cane to stir our Dolce Gusto Chococino, and it was divine. The sleek and stylish NESCAFÉ Dolce Gusto machine brings the “coffee house” into your own home by delivering up to 15 bars of professional pressure to make the perfect cup of coffee and frothy milk every time. With the compact, no-mess capsules, you just pop them into the machine, and with the press of a button, out comes a great cup of specialty (or coffee house quality) coffee in under a minute! What is great about the Dolce Gusto is that it can also brew a variety of specialty coffee beverages including creamy layered lattes, sweet caramel macchiatos, bold espressos, even a frosty iced cappuccino. For the non-coffee drinkers in your house Dolce Gusto also brews a deliciously indulgent Chococino. The Quality: you get coffeehouse-quality brewed coffee and specialty coffee drinks right at home! 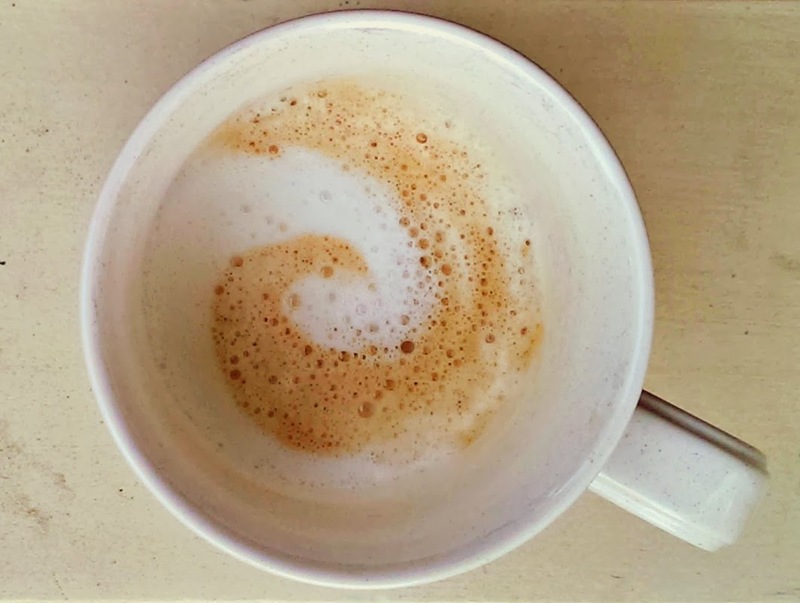 The Dolce Gusto makes wonderful macchiatos, lattes, capuccinos and other drinks, complete with frothy steamed milk that you can swirl into cool designs, just like the baristas do (okay, maybe I can't quite get those intricate designs the baristas can do, but a swirl is good enough!). 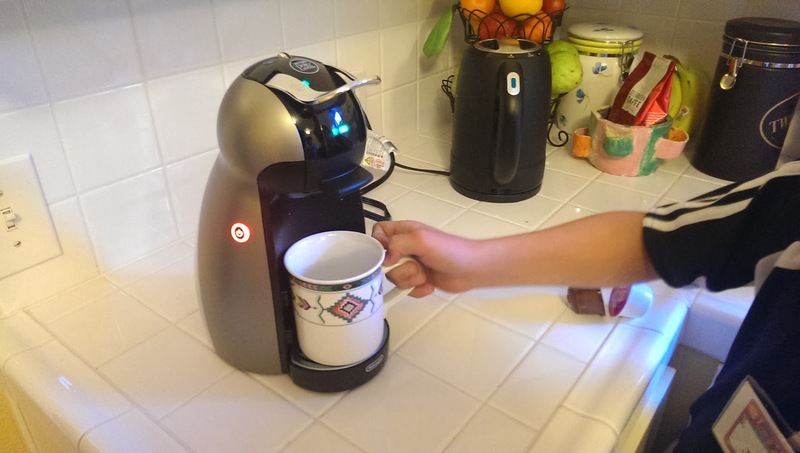 Easy to use: It's so simple, even my kids can make their own hot chocolate or iced tea. Just fill the tank with water, load a capsule into the machine, set the water level (the water level for each drink is clearly indicated on each capsule so you never have to remember! ), and press the hot or cold button. The Dolce Gusto machine does the rest! It takes less than a minute to get the machine ready, and there's virtually no waiting time between cups. It's also so easy to clean -- just rinse the capsule slot and the drip tray. Space saving: The Dolce Gusto Genio is small and compact, which works perfectly for my small kitchen. 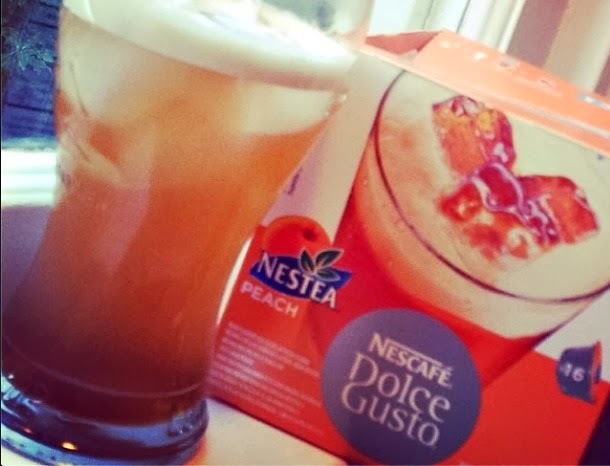 Variety: The Nescafe Dolce Gusto doesn't just make hot drinks, it makes cold drinks as well. I love the Nestea Peach iced tea, and I can't wait for them to introduce more flavors! If you don't like caffeine, try their Chococino -- a smooth, velvety coffeehouse-quality hot chocolate! My kids and I are addicted to it! * The temperature doesn't seem hot enough. The temperature is actually perfect right after the drink is dispensed, but after those first few moments it seems to cool down pretty quickly. This isn't too much of a problem for me, but other people like Alfie like their coffee and tea piping hot (which is one reason he couldn't give the machine his full endorsement). A good workaround is to preheat the cup by placing it under a running hot water tap. * Since this is a Nescafe branded machine, it stands to reason that it only takes capsules that use Nescafe brand coffee and tea -- which kind of limits the variety of offerings. I'm a;so hoping they come up with more non-coffee varieties like lemon iced tea, raspberry iced tea, plain black tea, Earl Grey tea, peppermint hot chocolate, salted caramel hot chocolate, and other yummy drinks! * The Dolce Gusto capsules aren't readily available at grocery stores. The only store I found that carries them is Bed, Bath and Beyond. The online selection is slightly better: you can find the capsules on the Dolce Gusto website, Amazon.com, and BedBathAndBeyond.com, Walmart.com, and a few other coffee specialty websites. Use code GustoGift! 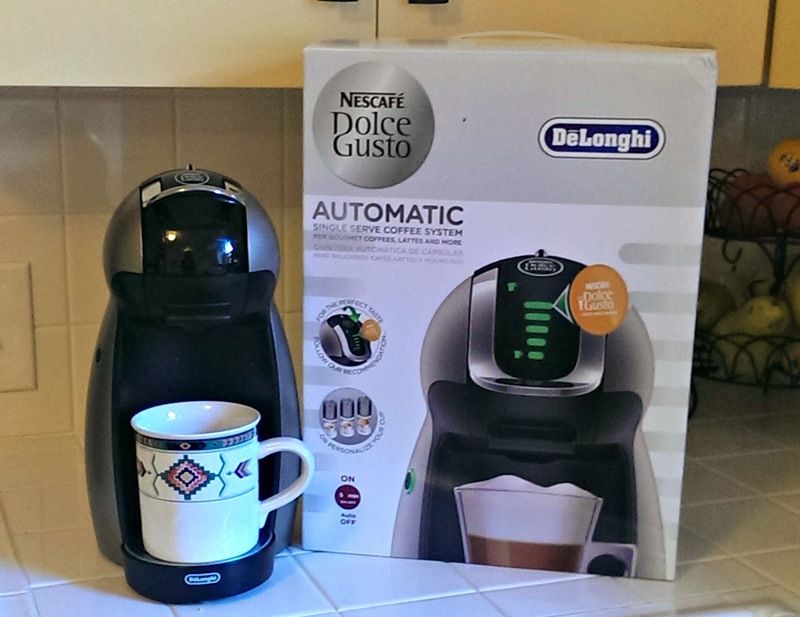 to save 20% on a NESCAFÉ Dolce Gusto Coffee Maker. it makes a great holiday gift for the coffee lover in your life! If that coffee lover happens to be you, so much the better! 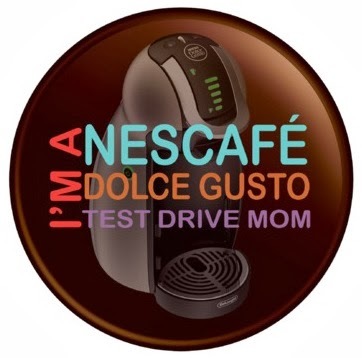 Disclosure: I participated in a campaign on behalf of Mom Central Consulting for NESCAFÉ Dolce Gusto. I received product samples to facilitate my review as well as a thank me for my participation. The views and opinions expressed here are my own. Who doesn’t love a great deal during the holiday season? And who wouldn't want to have holiday-ready hair throughout the season? 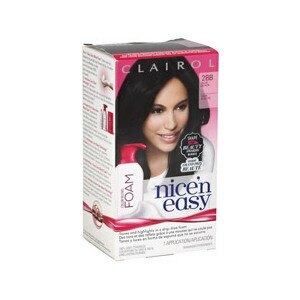 Now you can have both, because Clairol Nice ‘n Easy Foam Hair Color is 50% off at all CVS stores and online at www.cvs.com. 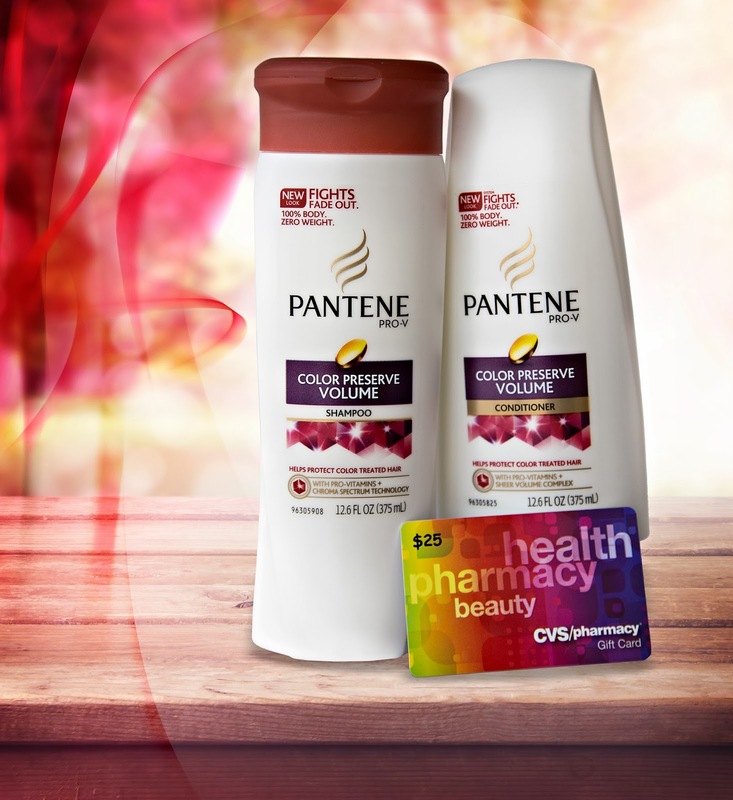 The Clairol formula, with exclusive Color Blend Technology, is proven to give more blends of tones for perfectly natural color that is true to you. It's easy to apply, absorbs quickly, and locks in just the right shade of color, so your hair is sure to shine in the spotlight. Limited quantities are available so it’s time to stock up for the holidays! Leave a comment on this post and share your favorite holiday hairstyle. Disclosure: Thank you to CVS and Procter & Gamble (via Blue Chip Communications) for providing a gift pack to give away, as well as a second gift pack for me. The views and opinions expressed here are my own. When you think of a hybrid, what comes to mind? Probably a small, futuristic-looking car that glides to a stop and doesn't make any noise. 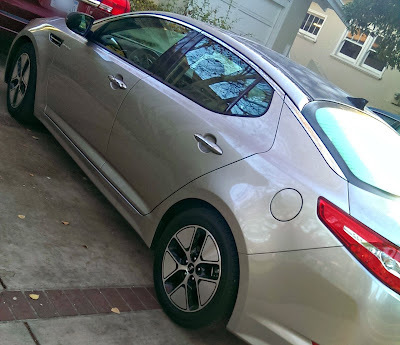 The last thing you'd think of is a sleek sports sedan, but that's exactly what showed up at our home the day I was scheduled to start testing the Kia Optima Hybrid. In fact, when I told the family a couple of weeks ago that I'd be reviewing a Kia Optima Hybrid, they were distinctly unimpressed. Jammy said he wasn't really interested in any eco-friendly car except the Tesla, and if he had a choice of cars to review, he'd pick a Maclaren. The smaller cars use less fuel, so hybrids are small and cramped, right? Wrong. 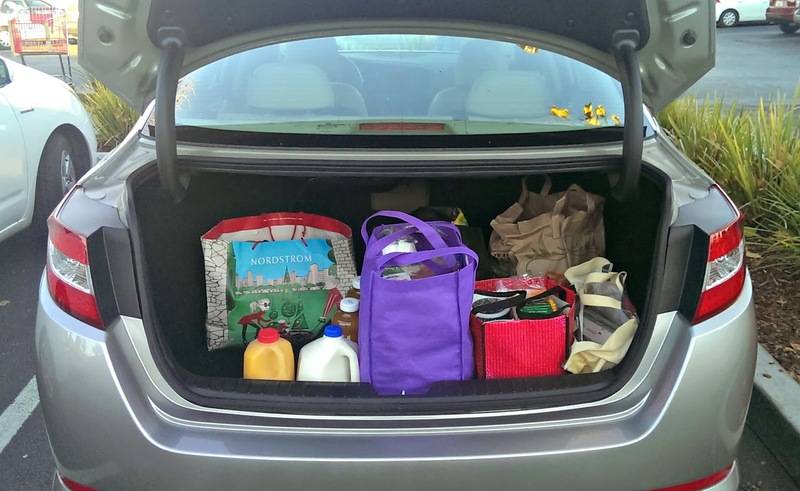 The Optima is extremely roomy, with lots of legroom even for the rear passengers. The kids had no problem fitting into the back seat, and I'd say even 3 adults wouldn't feel too cramped. 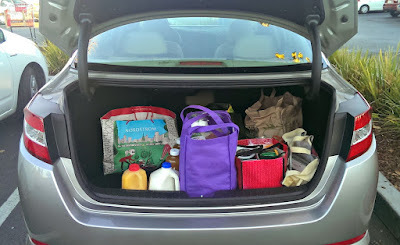 Even the trunk space was huge, despite the fact that the electric battery took up a bit of real estate. 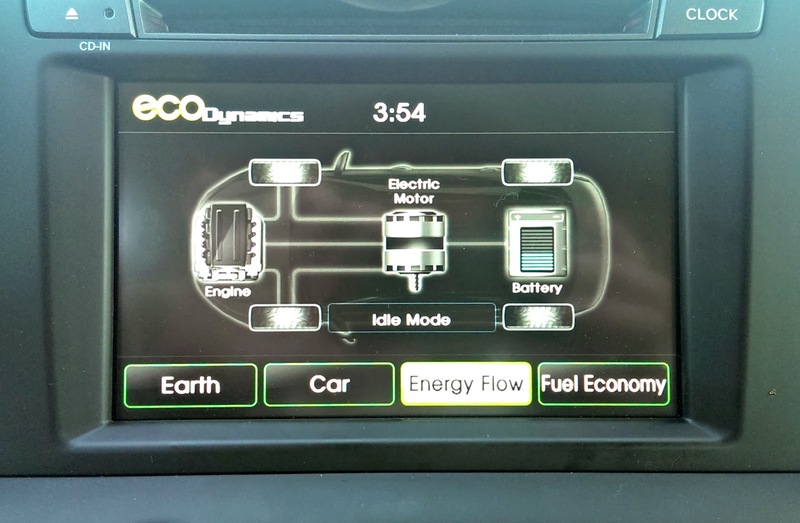 The Optima has an Eco-boost setting that you can activate for even more fuel efficiency, but when you're in regular mode, the accelerator packs plenty of punch. Even Jammy, my sportscar fanatic, was impressed with the low-slung styling of the Optima Hybrid ("It looks just like a Tesla!" was his first comment) and its sporty wheels. 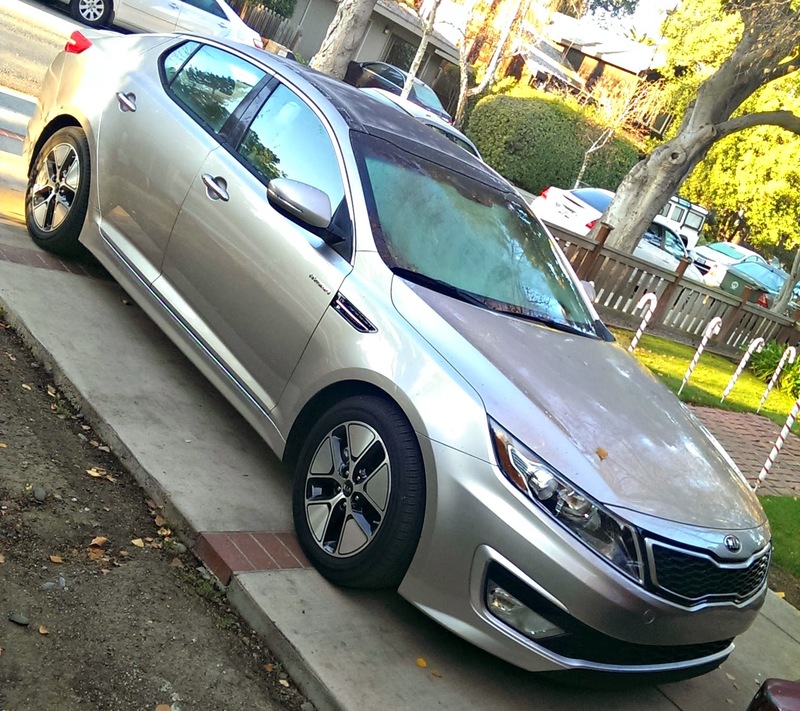 The Optima Hybrid is sleek and elegant even for a regular midsize sedan, let alone a hybrid. The Optima Hybrid is just as luxurious inside as it is on the outside. The model we tested had leather seats (with heated and ventilated front seats), a panoramic sunroof, voice command navigation and Sirius XM radio. Okay, this is one stereotype that is 100% true! 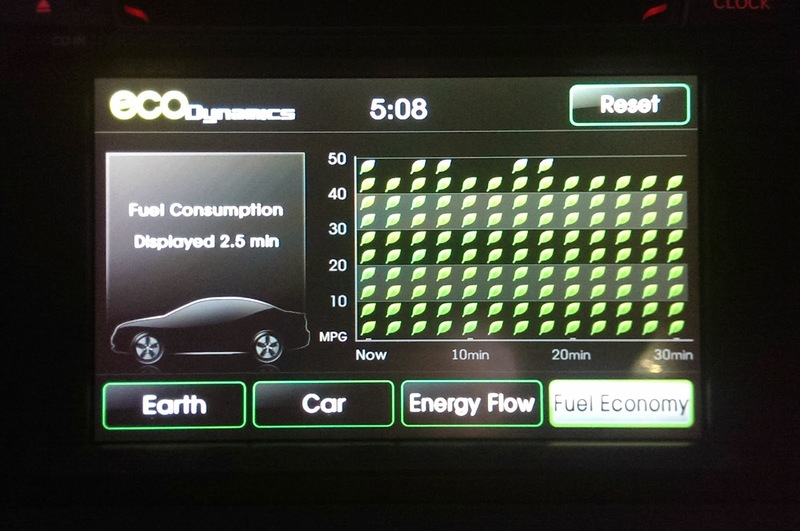 The Kia Optima Hybrid gets gets an estimated mileage of 35–36 city / 39–40 hwy. 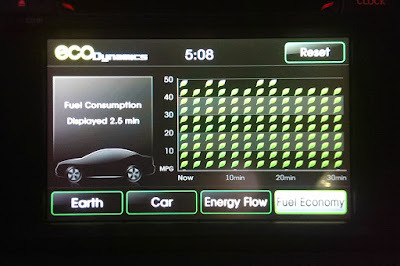 I drove the Optima Hybrid for a week, sticking to my normal driving patterns (soccer carpools, grocery runs, etc..), and couldn't even manage to finish a quarter tank of gas! Actually, I ended up taking the car to places I'd normally walk to (like school, which is about half a mile away! ), and I still used up way, way less gas that I would with my van! Okay, this is another spot-on stereotype. 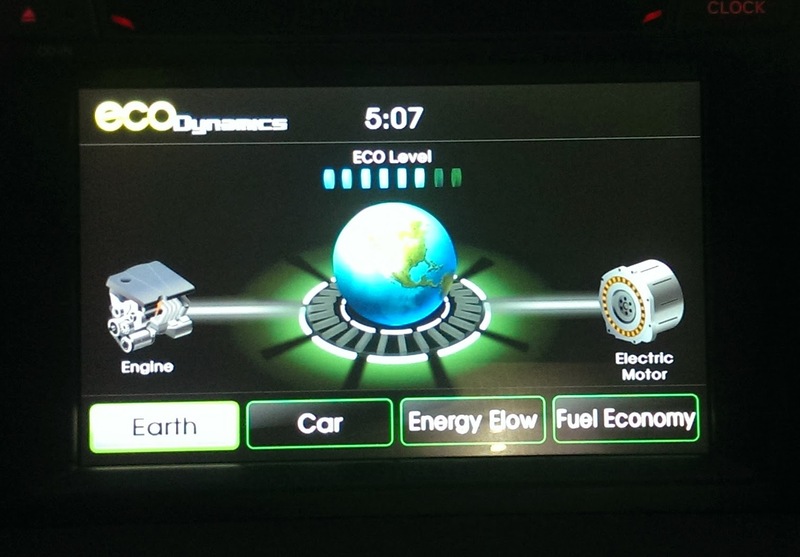 We had so much fun exploring the display features of the Optima Hybrid! We were so fascinated by the graphics showing us how power switched from the gas engine to the battery and vice versa, and every drive became like a video game, with all the kids determined to get the Optima Hybrid's eco-friendly meter up as high as possible! It really got all of us thinking about how we drive and how we can save gas and reduce our carbon footprint just by modifying driving habits. So cool! If you're in the market for a hybrid, check out the Kia Optima Hybrid (starting MSRP $25,900–$31,950). Come to think of it, check it out if you're in the market for any car! Disclosure: I was loaned a Kia Optima Hybrid to test drive for a week, courtesy of STI. The views and opinions expressed here are my own. The holidays are a time to celebrate and be happy. Just think of how many times we say the word "happy" (or versions of it) in the greetings we exchange at this time of the year -- Happy. Merry. Bright. Joy. Blessed. Wonderful. But when someone in the family is sick, it can be much more difficult to find the HoHoHo in Holidays. In times of trouble, you have to grasp at every little bit of happiness you can find, which is why it is so important to take the time to support your family and friends who are going through rough times. Even a caring word or a message of encouragement can brighten their day because you're letting them know that you are thinking of them, that they are not alone. That's why I'm in awe of CaringBridge, a nonprofit that helps families stay connected and supported during trying times. CaringBridge provides free personal websites, giving people a way to show their support for their family and friends who are going through some kind of health journey. When a friend's daughter was diagnosed with leukemia, I saw first hand how CaringBridge served as a virtual gathering place for their loved ones to leave messages of support and love. My friend and his wife were able to update everyone on their daughter's condition without having to respond to dozens of emails -- which gave them more time to spend with their daughter. Disclosure: I participated in a campaign on behalf of Mom Central Consulting (#MC) for CaringBridge. I received a promotional item as a thank you for participating. The views and opinions expressed here are my own. Attention expectant parents: Is cord blood banking right for you? Did you know that the holiday season is the time of the year when most babies are conceived? I guess the cold winter nights make couples want to snuggle, and all the celebrations (not to mention the champagne and eggnog) put people in a joyous mood! After all, there's nothing better to celebrate than the arrival of a new family member, and with today's pregnancy tests, expectant parents can begin celebrating as soon as they see "positive" on a pregnancy test. With all that celebrating comes planning -- setting up the nursery, finding a pediatrician, researching baby gear. Unfortunately, one thing that most parents don't plan for is something that could turn out to be one of the most important decisions they could ever make. I'm talking about banking their child's umbilical cord blood. Cord blood is a rich source of stem cells, which are unique because they can develop into many different cell types. The possibilities for medical science are enormous -- and those stem cells could save your child's life! Cord blood stem cells have been used in the treatment of more than 80 conditions and are currently being evaluated in FDA-regulated clinical trials for their potential regenerative ability in common health issues including autism, cerebral palsy, pediatric stroke, and traumatic brain injury. However, because parents are largely unaware of their value, umbilical cord blood containing these pristine cells is frequently discarded. In fact, less than ten percent of parents choose to bank their child’s cord blood today. There are actually two options for banking cord blook: public or private banking. Public banking lets parents donate their newborn stem cells at no cost -- however, there is no guarantee that your donation will be available to you. Private banking stores your child's cord blood for your family's exclusive use. You pay an initial fee for the cord blood banking kit that your OB will use to harvest your child's cord blood right after birth (the kit will be sent to your OB, who will then harvest the cord blood and send it to the lab so you don't have to worry about it). Every year thereafter, you pay an annual banking fee. We decided to bank our children's cord blood almost as soon as we knew we were expecting. Since our kids are mixed race, the odds of finding exact matches for bone marrow from national registries are extremely small. We figured the same would apply to stem cells -- if they ever had a medical condition that could be alleviated or cured with stem cells, their best bet would be their own stem cells! We look at cord blood banking as an insurance policy -- but it's a policy that you can only sign up for at one point in your child's life, the moment after their birth. So we signed up to bank their blood with Cord Blood Registry (CBR), and we've never regretted our decision. CBR is the first and only newborn stem cell bank to pioneer FDA-regulated clinical trials with leading medical centers to explore the potential benefits of newborn stem cells for many conditions that presently have no cure. If you think you might want to bank your child's cord blood, talk to your doctor to get all the facts. Like I said, you only get one shot, you can't change your mind after your baby is born, so it's important to make an informed decision before your due date. I highly recommend going to Cord Blood Registry's website to see whether cord blood banking is right for you. For my family, the decision was easy. If any of my kids ever get sick, I'd do anything to find a cure. 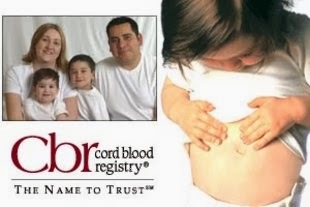 For me, that starts with banking their cord blood with CBR -- so that if ever they need it, it will be there. Disclosure: I participated in a campaign on behalf of Mom Central Consulting for the Cord Blood Registry. I received promotional item to thank me for my participation. The views and opinions expressed here are my own. One of the things I love most about the holidays is reliving the traditions and memories you grew up with and sharing them with your children. From watching the Nutcracker to trimming the tree to driving around the neighborhood to look at lights to watching holiday specials on tv, I love it all! The best thing is, there's still lots of room to introduce new things and make your own traditions. Take holiday tv specials, for instance. There are some holiday programs we watch year after year, and yet there's so much great holiday programming being introduced that it's impossible not to watch! To help get kids excited for the holidays, NCircle has introduced several new holiday videos that families will love because they feature some of tv's most beloved characters. I received three great videos to review -- The Snowman and the Snowdog, Mike the Knight: Mike's Christmas Surprise, and Yo Gabba Gabba: A Very Awesome Christmas Special -- and we enjoyed watching all of them. My favorite was The Snowman and the Snowdog, because I watched the original movie, The Snowman, way back when it first came out thirty years ago The Snowman and the Snowdog is the sequel to The Snowman, and it is just as enchanting as the first movie. The kids, on the other hand, loved Yo Gabba Gabba: A Very Awesome Christmas Special, because they loved Yo Gabba Gabba as kids, so watching it gave them the same warm sense of nostalgia that watching The Snowman and the Snowdog gave me. It just goes to show you that you're never too old to watch holiday animation! Check out all three titles and share them with your kids -- you just might end up adding them to your own holiday traditions! 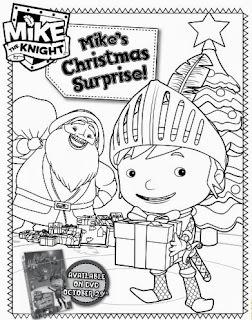 • "Mike the Knight: Mike's Christmas Surprise!" Mike’s Christmas Surprise! is packed with five stories (including a bonus episode), interactive games, a music video, and more! When a special visitor surprises Mike for Christmas, excitement fills the air. The royal family decides to play a game, but Evie’s magic causes Christmas chaos. Will everything be back to normal in time for the Christmas feast? • “Yo Gabba Gabba: A Very Awesome Christmas Special"
Two stories are contained on this festive new DVD releasing for the holidays. In “A Very Awesome Christmas Special,” it's a Christmas celebration when DJ Lance places a gingerbread house into Gabba Land! The Gabba gang makes new friends with neighbors, and everyone is excited to exchange gifts – but what can they possibly get for Santa Claus? In the story titled "Christmas,” the Gabba gang learns that even though much of Christmas is about receiving, there’s a lot of joy in giving to others. • "The Snowman and the Snowdog"
When a young boy and his mother move into a new house, the boy discovers a secret box hidden under the floorboards of his bedroom. In the box, he finds a hat, scarf, some lumps of coal and a shriveled tangerine - it's a snowman-making kit! Later that day, when it starts to snow, the boy builds a Snowman and, with the spare snow left over, a Snowdog. That night, the Snowman and Snowdog come to life and take him on a wonderful adventure. As dawn breaks they fly home, but before the boy returns to bed a magical surprise awaits him! 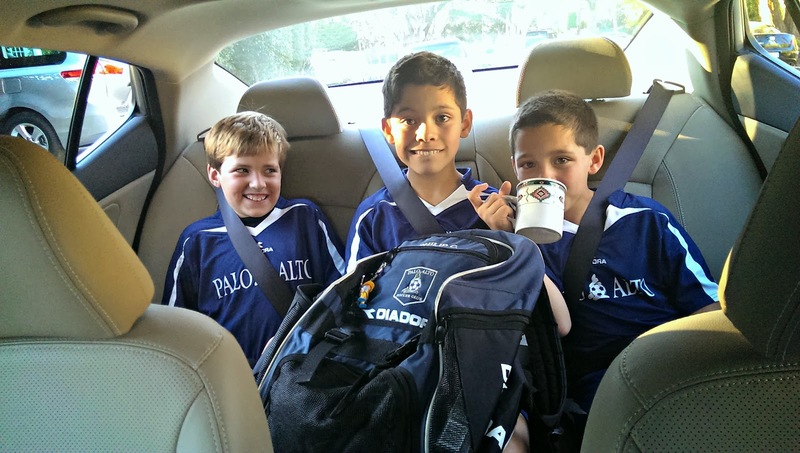 Need activities to keep the kids busy during the holiday break? Download and enjoy this adorable “Mike Saves Christmas!” coloring page! Disclosure: I received a product sample to facilitate my review, but have not been paid to review the product or give my opinions. Product information (in italics) is provided by NCircle Entertainment. The views and opinions expressed here are my own.